What's it going to take for the US to catch China in the AI race? WASHINGTON — The global race for AI is heating up, and more countries are buying into the technology and realizing that social structures and economies need to be retooled accordingly. 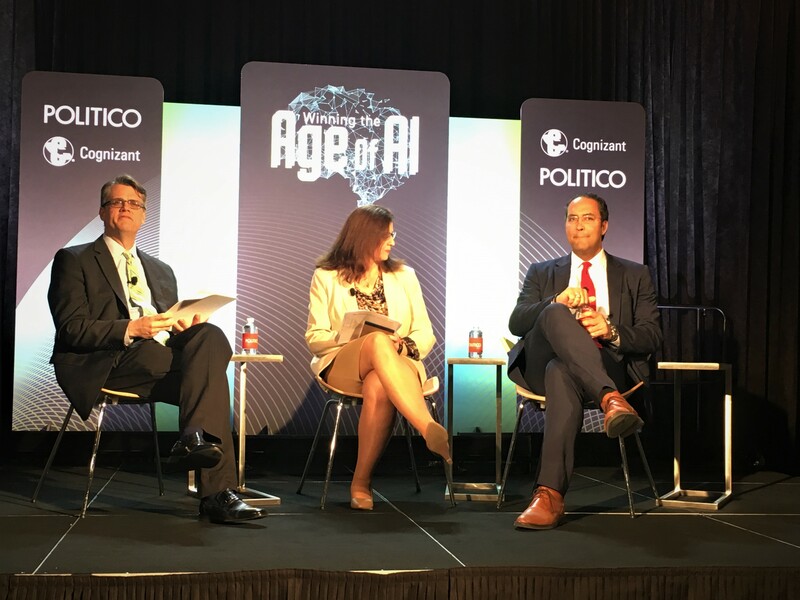 China, the global AI front-runner, is benefiting from an authoritarian regime that can plan 25 years ahead under the same leader, according to Rep. Will Hurd, R-TX, speaking at Politico's Winning the Age of AI event in Washington Thursday. The U.S. faces more churn in executive and legislative leadership, and planning a technology strategy 10 years out is hard when passing a budget for the next year already dominates so much political attention. But free markets always win out, and while the U.S. may be behind, it's not so much that it can't catch up, according to Hurd. Political leadership is beginning to take notice, and hearings on the Hill to assess the impact of AI on the U.S. economy and evaluate federal agencies' work on the technology are on the rise. Rep. John Delaney, D-MD, and fellow panelist Rep. Pete Olson, R-TX, co-chaired the AI Caucus for the 115th Congress after recognizing the lack of understanding and knowledge in Congress about AI and other technologies. The caucus has since grown to about 15 members and seeks to convene Congress with tech experts more often. But getting the U.S. fully on board the AI race will involve not only politicians but workers and businesses across every industry. Fears of AI's impact to the job market have led to many industries and workers to drag their heels as years-old studies predicting that one-fifth of workers will lose their jobs continue to dominate the discussion. But these numbers may be inflated in light of newer research and only paint part of the picture. Technology has always created more jobs than it takes away, and there is no reason to think the age of AI will be any different, according to Delaney. Routine jobs will likely be impacted more by automation, while cognitive jobs will be affected more by artificial intelligence. Rep. Will Hurd and Teresa Brown discussed how foreign-born STEM workers are currently an indispensable portion of the U.S. technology workforce. And overall, there won't necessarily be fewer jobs but rather different jobs, said Byron Auguste, CEO and co-founder at [email protected] Already, a new class of workers is emerging around this new technology, and jobs that have remained relatively unchanged for decades, such as factory work, are removing monotonous, repetitive tasks and freeing workers up for new responsibilities. There are still many hurdles left to cross, such as countering AI biases and auditing how algorithms make decisions, said Hurd. Ensuring that the benefits of AI are equally distributed, especially in terms of impacts to the job market, will also be critical. The pie isn't growing evenly right now, and AI can widen the gap between the "haves" and the "have-nots," according to Osonde Osoba, researcher at RAND Corporation. Some workers affected by automation are retrained or have their their responsibilities shifted, for many unskilled workers this may not be an option. With other routine-based jobs being impacted, finding a new position after displacement can be increasingly difficult. The U.S. is suffering from a talent problem in STEM. Efforts to reskill tends of thousands of workers are underway, but the process is slow. Matching talent to open positions is increasingly difficult, and businesses may witness a shifting paradigm in how they recruit and what they look for in candidates. Individuals who didn't go through the classic college route can easily be overlooked in current hiring models but may be crucial to filling the shortage of STEM workers. The introduction of any new technology is sure to cause some level of friction in the job market, but handling this friction effectively while implementing positive technological change is the best course forward. Digging in the heels and choosing not to participate in the fourth industrial revolution is not. Immigration plays a huge role in the success of the U.S. technology industry today. After benefiting from the brain drain of other countries for decades, changing immigration policies are making immigrants not want to stay in the U.S. or even come in the first place, said Hurd. Competition for STEM workers around the world is heating up. Countries with competing tech hubs, such as Canada, the U.K., Singapore and China, are facilitating visas for tech talent and for students to stay and work, said Theresa Brown, director of Immigration and Cross-Border Policy at the Bipartisan Policy Center. In the pipeline, the majority of graduate degrees in STEM fields are going to foreign born students, with more than 50% of doctorates in engineering and doctorates in computational and information science going to foreign students. Most of these students are coming from China: In 2016 to 2017, 350,000 Chinese foreign students came to the U.S., according to Brown. And these foreign STEM students and workers are accounting for a significant portion of new technology patents. The U.S. clearly needs to find a way to bring more American talent into the STEM field, though such an effort will be a decades long process. The current composition of foreign workers is the reality of the STEM workforce, and the U.S. needs to understand that innovation in STEM is often driven by foreign-born talent, according to Brown. But the U.S. cannot depend solely on foreign talent and needs to boost its home-grown talent by implementing STEM education at an earlier age as part of standard curricula, Hurd said.